Drop a line to the moon. Yes. 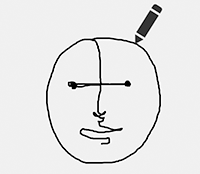 Your drawing. On the real moon. We've filled the disc with drawings! Please check back for updates on the project. 2. 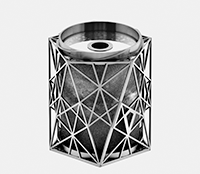 Your drawing (and 9999 others) will be micro-etched onto a small sapphire disc. 3. 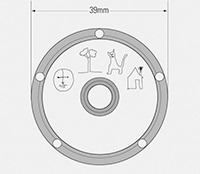 The Moon Drawings disc will be incorporated into the endcap of the Moon Arts Ark, a gift for the Moon. 4. The Moon Arts Ark will be brought to the Moon aboard the Andy rover developed by Astrobotic and CMU. 5. 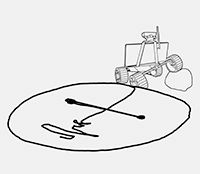 If circumstances allow, one or more of the Moon Drawings will be traced into the Moon's soil by the tracks of the Rover. Welcome to Moon Drawings: a project to extend artistic expression to the Moon. In spring 2015, nearly nine thousand people contributed line drawings to this project. 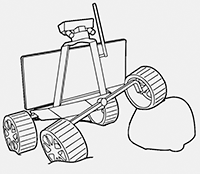 These drawings will be etched on a sapphire disc, sent to the Moon, and potentially traced by a robot rover into the Moon's soil. The disc, contained in a sculpture called the Moon Arts Ark, will be shuttled to the Moon in 2016. It will remain there for millennia: a poetic gesture reaching out, far beyond any objective existence on Earth. >> Find out more here. Here are some of our favorite contributed drawings. If you'd like to receive occasional updates about the Moon Drawings project, please provide your email address below. We promise we'll only use your address to inform you about the project, and we'll never share your email with anyone.